Join us this week with our guests Robbap1, XNotMalcolm and Hidanas from CinemaChat Podcast! Movie talk, Cincinnati update, the new chat bot, Turdhat Help You, plaid, someone turns 40, Sword News, world’s “biggest”, Shia (n0), Romania, Dux and Segal, and much much more! Be sure and join us LIVE, you can listen and chat on the website. We normally record Saturday 9pm Pacific/Midnight Eastern. If you’d like to help the show hit the “Support The Show” tab on the website and click through our link when you make Amazon purchases, or click the “T-Shirt” tab and buy a shirt. We thank you so much for your support. Join Us Live in the Dumb As Dirt Chatroom! Saturdays @ 9PM PST/Midnight EST. 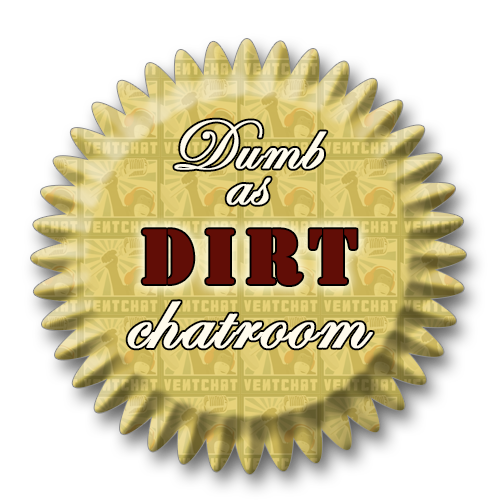 Join us in the Dumb As Dirt Chatroom!